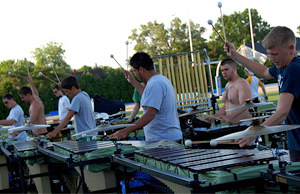 The start of the 2009 Drum Corps International summer season is finally here, and everyone seems to be feeling the excitement! This Friday, 13 very excited corps will kick off the season in Chambersburg, Pa. and Rockford, Ill. on the very first day of the competitive 2009 DCI Tour. Corps members and staff are anxiously awaiting the end of the week so they can hit the road and show the product of all their hard work to the world. "The corps is very excited to get to Chambersburg on Friday and unveil the show to the public," said Boston Crusaders executive director Thomas Spataro. "Cabin fever usually sets in around the end of the second week of the preseason—they are raring to get on the tour buses, their 'second home' for the summer, and they're ready to go." 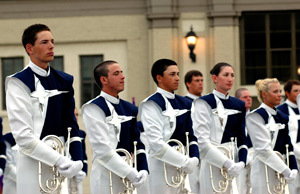 Howard Weinstein, director of the Blue Stars, and Spirit director Joel Vincent have seen that same anticipation in their corps. "The members are counting down the hours until step off at the first show," Weinstein said. "The kids feel like 'spring training' has gone by very quickly, and they are highly motivated for the chance to perform for Drum Corps International fans throughout the country." Vincent said, "Our corps members and staff are very excited for the summer. We left Sunday on tour and the excitement level was so much fun to witness. Everyone was ready to start traveling." One of the most exciting parts of starting the tour is the chance to perform for an audience and feed off the energy of eager fans, corps directors said. "I think everyone is looking forward to performing for an audience," Vincent said. "It has been a lot of fun to see those who have come to watch our rehearsals react to the music. I hope audiences across the country have as much fun with the show as we have had preparing it." Madison Scouts executive director Chris Komnick said performing for fans is what he and the Scouts are looking forward to the most in 2009. "I think we've put together a show that fans are going to look forward to seeing and talk about when they leave the stadium," he said. "As well, the entire process of going on tour, rehearsing and performing provides many opportunities for the members to develop new skills and experience new things in their lives. That's why we do drum corps." Drum corps members have been rehearsing at weekend camps since November and full time since the end of May to prepare for the next few months of competition. Though competitions start this week, the corps will continue to change and hone their productions as the season progresses. "We have worked hard for four weeks. The members have done a fabulous job and although we will have more work to do, we believe we are more prepared and performing at a higher quality level than we have in years," said George Hopkins, director of the Holy Name Cadets. 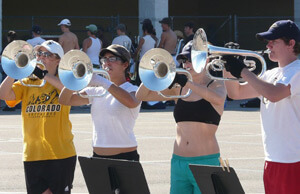 Komnick said the Madison Scouts took advantage of technology to ensure that corps members were as prepared as possible before spring rehearsals even began, using computer-based rehearsal software for individual preparation between camps and online video sharing for color guard members to communicate about different techniques. "Undoubtedly, I think we found the corps better prepared coming into May and we have also had good weather the past month, resulting in a very productive spring training," he said. Corps are not the only ones that have had a lot of preparing to do; those who put on DCI Tour events have been planning for months. Scotty Wild, who has been in charge of a show in Stillwater, Minn. for 16 years, said preparing for the event began just after the holidays this year. That June 20 competition is one of the first of the season. "Running a DCI event early in the season gives us an opportunity to host many of the top corps for our show before they split up to tour various parts of the country," Wild said. After Friday, the season marches full speed ahead with more than 100 competitive events across the country. The season culminates with the DCI World Championships from August 4-8 in Michigan City and Indianapolis, Ind. Cavaliers director Bruno Zuccala is already excited for the biggest series of DCI events all year. "Indianapolis is a great city. It's pretty close to our hometown of Rosemont (Ill.), so our local fan base and alumni have the opportunity to be a little closer," he said. "Our housing site there is perfect and we have a really good accessibility to a lot of things in there in the city, so we think it's a great venue and we're really happy that we can spend a whole week there preparing for the championships." Kevin Smith, Carolina Crown's executive director, said his corps is ready to get the tour started and show off their product to those outside the Crown family. "I think everyone is looking forward to a great summer," he said. "... the great fans, seeing all the great performances, renewing friendships with classmates, colleagues and support teams from the other corps ... it's what makes our activity so special!" Find an event near you! View the complete '09 DCI Tour schedule.